The original edition of Living In The Light was published, 25 years ago, how are the ideas in your book important today? What I write about in Living In The Light, in some respects, feels even more timely and relevant than when I wrote it. I believe we are in a global healing crisis on many levels; financially, emotionally, spiritually and physically (as a planet). We are struggling with how to resolve the multiple levels of chaos we are experiencing. The path through is the same, to become conscious of how we are living and in the choices we are making. We can do this through connecting with our inner guidance and to also look honestly at what is holding us back from that connection. Big changes can feel out of control and disastrous. However, these changes can bring attention to what has been hidden, can bring light to what has been swept under the rug, and ultimately can be our path to freedom. This is true healing, which is to reveal the issue or problem, to acknowledge it, and then accept it and bring balance and consciousness to the process. Our inner guidance it what leads us through this process and brings us into balanced living. What is inner guidance and how do we distinguish it from other voices within? Inner guidance is our ability to be connected to our intuition as a resource for knowledge, guidance, and direction. I believe our intuition, is a natural ability that we are born with. However we may not have been raised in an environment or culture that supports it, or maybe it was not understood or valued. By paying attention to this sense, to these subtle messages, we can regain connection and strengthen it to be a vital tool in our life. Some people find that being in touch with their inner guidance is experienced as a feeling, or physical sensation often a "gut feeling" or a strong internal knowing. You can learn to distinguish this connection by paying attention to your body, and what you are experiencing or feeling when connecting with your inner wisdom. I used to talk about my intuition as if it was the only "voice". I have discovered that there are different voices, in fact many aspects or "selves" within me. Intuition is one of these selves. Often feelings of doubt or fear diminish our ability to sense our intuition. We can practice simple meditations where we ask a question or think about something we are concerned about, then "listen" for guidance and direction. Over time, and often quickly, we begin to distinguish our own unique intuitive "voice". The messages may be experienced as a sound, a symbol, a color, a phrase, a feeling or a knowing. Each person experiences their intuition differently. Be open to how you experience your connection with your inner guidance. You refer to "living in the light" as exploring the deep places within us and shining the light of our consciousness into them. What do you mean by that and can you say more about that please? In Living In The Light, I talk about shining light into the darker places within us or looking into our shadow sides. This can sound weird or be misunderstood and I think it is important to explain. We have many aspects within us and these aspects are like "selves" with traits and qualities that make up our personality. Some aspects we are very comfortable with and they serve us well at work or in our family life. I call these "primary selves". Other aspects we may not be comfortable with and in fact may suppress, deny or hide. These aspects which we try not to reveal, are "disowned selves" and often are referred to as our "shadow side". Viewed in this way, "bringing light to our shadow" means becoming conscious of what we are suppressing or denying. On the outset, this may seem like a scary process. However, bringing awareness to this process allows us to have conscious choice in our lives. We are no longer locked into being a certain way in the world out of fear or habit. We can begin to "own" or embrace what we have denied and find a balance that is right for us. We discover that even our disowned selves have a role in our lives and can even be gifts or the perfect antidote for what is ailing or troubling us. We begin to realize that we need all these parts within ourselves and that we must have access to these different energies to experience authentic wholeness. Can you say more about these "selves" you are discussing? To give an illustration of primary and disowned selves, I would like use the example of my friend Paula. Paula has an important role in a company working well over 40 hours per week. She has two children that she has raised as a single mother. In addition to her work, she volunteers at her community center and visits her parents every weekend with her kids. Paula describes herself as being responsible, a good mother and daughter, a perfectionist, care taking of others, driven, outgoing and very smart. Several opposites of these traits could be described as irresponsible, sloppy, uncaring, apathetic and not bright. These tend to be negative terms and understandable why she "disowned" them. At a point in her life, she reached a certain imbalance and started to experience some minor health issues and several shifts in her relationships at home and at work. Through working with this body of work and becoming conscious of the selves, she discovered that she was in fact over identified with her primary selves, limiting her ability to fully experience her life. She was sort of locked in to a certain way of being in her life. She further realized, that the disowned selves, were not negative and were essential to her finding balance in her life. The words that were used to describe the opposite qualities were negative because her primary selves were viewing them that way and keeping her from being seen that way. However she found freedom in not being responsible for everyone and everything all of the time. She found new ways to relax and rejuvenate through taking more restful time and not caring for others in all of her free time. She also realized she had more to offer by taking care of her self. The goal of this work is to have conscious choice. Once we become conscious, we can make decisions through a process that embraces all of who we are and acknowledges the different feelings or thoughts we may be having. Through this process, we can experience balance, wholeness, and fulfillment in our lives. How can we make the necessary changes in our own lives, to support the global changes you talk about in your book? I believe that as we do our own work, as we heal ourselves, we can help to heal the world. Once we become conscious of the many aspects or "selves" within us, we can begin to see the people and situations in our lives as reflections of our own process. In fact, they become powerful teaching opportunities where we can learn about ourselves and become conscious, leading to healing and balance in our lives. One way of beginning this process is to become conscious of what we perceive as negative or what we reject as unpleasant. We begin to see these as reflections of ourselves and of experiences in our own lives. Often these people and situations are mirroring the energies and aspects within us that we have disowned. As we embrace all of who we are and have the potential to be, as we find compassion for our past hurts and acceptance of the places within us that we try to bury or hide, we naturally experience understanding, compassion, and acceptance for others. We can not find this acceptance of others without accepting ourselves first. Focusing on our healing process ultimately leads us to healing relationships and situations around us. The effect continues to ripple out through our lives and others. My greatest hope is that through this time of healing crisis, a new way of living can come into view. As the global issues continue to unfold, as illusions continue to be smashed, as deceptions of governments and people are revealed, we are given an opportunity to directly address the issues that exist. We are no longer living in the shadow of old ideas and ways of being in the world. We are being given a gift, which is to live consciously as we rebuild and create a new foundation for a new future. 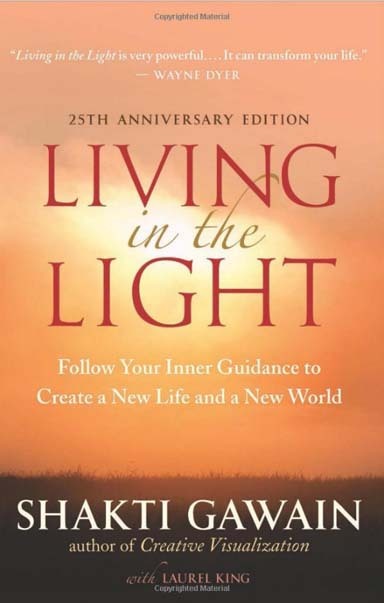 To order Living in the Light, 25th Anniversary Edition, from Amazon.com, click here! If you are willing to risk acting on what you believe to be true, and risk making mistakes, you will learn very fast by paying attention to what works and what doesn't. If you hold back out of fear of being wrong, learning to trust your intuition could take a lifetime. It can be hard to distinguish the voice of our intuition from the many other selves that speak to us, from within -- the different parts of ourselves that have their own idea of what's best for us. People frequently ask me how to differentiate the voice or energy of intuition from all the others. Unfortunately, there's no simple, sure-fire way at first. Most of us are in touch with our intuition whether we know it or not, but we're actually in the habit of doubting or contradicting it so automatically that we don't even know it has spoken. The first step in learning is to pay more attention to what you feel inside, to the inner dialogue that goes on within you. For example, you might feel, "I'd like to give Jim a call." Immediately, a rational, doubting voice inside says, "Why call him at this time of day? He probably won't be home," and you automatically ignore your original impulse to call. If you had called, you might have found him at home and discovered he had some important information for you. Another example: you might get a feeling in the middle of the day that says, "I'm tired, I'd like to take a rest." You immediately think, "I can't rest now, I have a lot of work to do." So you drink some coffee to get yourself going and work the rest of the day. By the end of the day you feel tired, drained, and irritable, whereas if you had trusted your initial feeling, you might have rested for half an hour and continued about your tasks, refreshed and efficient, finishing your day in a state of balance. As you become aware of this subtle inner dialogue be-tween your intuition and your other inner voices, it's very important not to put yourself down or diminish this experience. Try to remain a somewhat objective observer. Notice what happens when you follow your intuitive feelings. The result is usually increased energy and power, and a sense of things flowing. Now notice what happens when you doubt, suppress, or act against your feelings. Usually, you will observe decreased energy; you may feel somewhat disempowered or depressed. You may even experience emotional or physical pain. Whether or not you act on your intuitive feelings, you'll be learning something, so try not to condemn yourself when you don't follow your intuition (thus adding insult to injury!). Remember, it takes time to learn new habits; the old ways are deeply ingrained. I've been working intensively on my own re-education for many years, and while the results I'm enjoying are wonderful, there are still times when I don't yet have the courage or awareness to be able to trust myself completely and do exactly what I feel. I'm learning to be patient and compassionate with myself as I gain the courage to be true to myself. Suppose you are trying to decide whether to change jobs. You might have a conservative self that feels it would be safest to stay where you are, an adventurous self that is eager to do something different, a self that is concerned about what other people will think, and so on. One way to handle this is to "listen" to each of these voices and write down what each has to say (perhaps using a different-colored pen for each one). Then just let yourself sit with all the conflicting viewpoints for a while without trying to resolve them or make a decision. Eventually, you will start to get an intuitive sense of what your next step needs to be. As you get to know the different selves within you, you will discover that your intuitive self has an energy or a feeling that is different from the other voices. In time, you will learn to recognize it quite easily. One important step in learning to hear and follow your intuition is simply to practice "checking in" regularly. At least twice a day, and much more often, if possible (once an hour is great), take a moment or two (or longer, if you can) to relax and listen to your gut feelings. Cultivate this habit of talking to your intuitive self. Ask for help and guidance when you need it and practice listening for answers that may come in many forms: words, images, feelings, or even through being led to some external source such as a book, a friend, or a teacher who will tell you just what you need to know. Your body is a tremendous helper in learning to follow your inner voice. Whenever you feel your body is in pain or discomfort, it is usually an indication that you have ignored your feelings. Use it as a signal to tune in and ask what you need to be aware of. As you learn to live from your intuition, you give up making decisions with your head. You act moment by moment on what you feel and allow things to unfold as you go. In this way, you are led in the direction that is right for you, and decisions are made easily and naturally. If possible, try not to make big decisions concerning future events until you are clear about what you want. Focus on following the energy in the moment and you'll find that it will all be handled in its own time and way. When you must make a decision related to something in the future, follow your gut feeling about it at the time the decision needs to be made. Remember, too, that although I sometimes speak of following your inner intuitive voice, most people do not literally experience it as a voice. Often it's more like a simple feeling, an energy, a sense of "I want to do this" or "I don't want to do that." Don't make it into a big deal, a mysterious mystical event, a voice from on high! It's a simple, natural human experience that we have lost touch with and need to reclaim. The main sign that you are following your intuition in your life is increased aliveness. It feels like more life energy is flowing through your body. Sometimes it may even feel a little overwhelming, like more energy than your body can handle. You may even have the experience of feeling tired from too much energy coming through you. You won't bring through more energy than you can deal with, but it may stretch you a little! Your body's expanding its capacity to channel the universal energy. Relax into it and rest when you need to. Do things that help you stay grounded, such as physical exercise, being in nature, emotional self-nurturing, and eating healthy, substantial foods. Soon you'll feel more balanced and you'll even begin to enjoy the increasing intensity. At first you may find that the more you act on your intuition, the more things in your life seem to be falling apart -- you might lose your job, a relationship, or certain friends, or your car might even stop working! You're actually changing rapidly and shedding the things in your life that no longer fit. As long as you refused to let go of them, they imprisoned you. As you continue on this new path, following the energy moment by moment as best you can, you will see new forms begin to be created in your life -- new relationships, new work, a new home, a new form of creative expression, or whatever. It will happen easily and effortlessly. Things will just fall into place, and doors will open in a seemingly miraculous way. You may have times when you will just go along, doing what you have energy to do, and not doing what you don't have energy to do, having a wonderful time, and you will, literally, be able to watch the universe creating through you. You're starting to experience the joy of being a creative channel! *Excerpted from the book Living in the Light: The 25th Anniversary Edition Copyright C 2011 by Shakti Gawain. Printed with permission of New World Library, Novato, CA. All Rights Reserved.